In recent years, mezcal — tequila’s more interesting ancestor — has become a much buzzed-about spirit, showing up on menus at high-end bars and restaurants from New York to Moscow. But nothing about a typical mezcal distillery suggests a fashionable drink which can sell for $20 an ounce in a major metropolis: in fact, it’s more likely to put you in mind of a post-apocalyptic squatter camp. A typical distillery is mostly open to the elements, with a roof made of old corrugated iron sheets or slate tiles, held up by wooden posts. Arranged on the dirt floor are several large pine barrels big enough for a man to bathe in, full of what looks like fermenting marshland with flies feeding upon it. At the edges of the space are mysterious piles of hairy-looking plant matter. Elsewhere, flames can be seen in the bottom part of a low brick structure housing a log fire, above which sit several deeply-colored copper pot stills, connected by ancient-looking tubes. There is a lot of smoke. 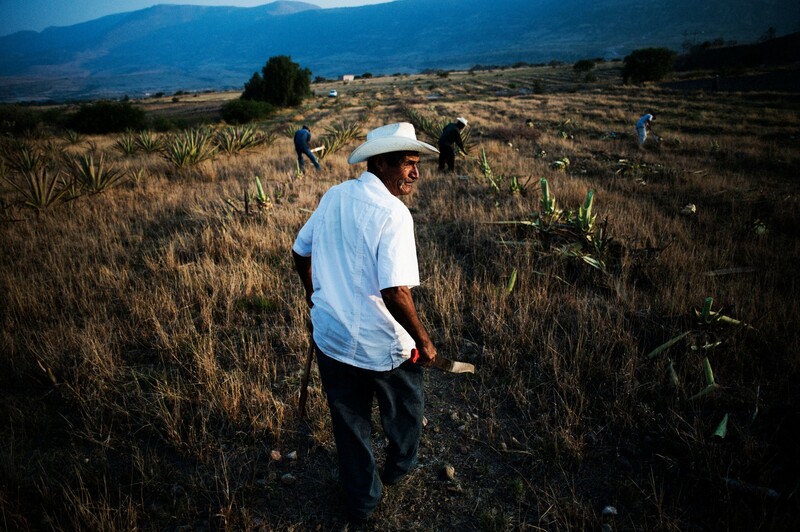 Workers known as jimadores harvest ripe espadín agave in preparation for making mezcal, the oldest spirit in the Americas. 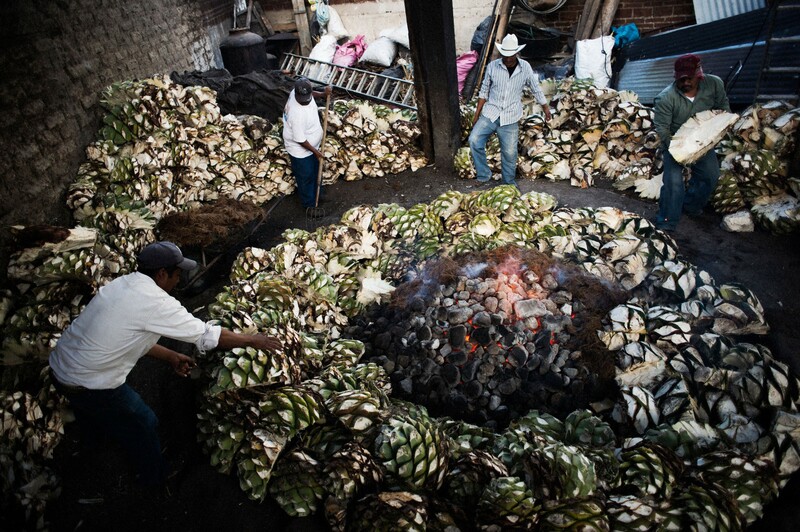 Mezcaleros top off the massive pile of espadín agave during the roasting process. The smoldering agaves will then be covered with earth and left to smoke for three days. 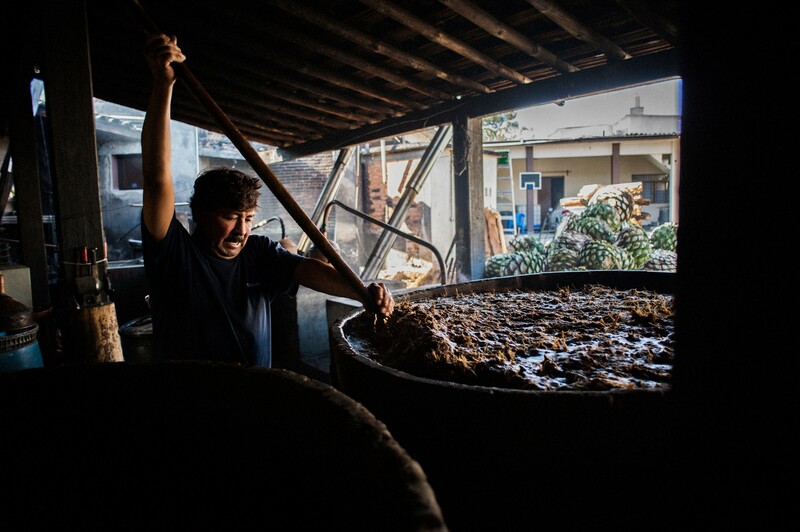 Master mezcalero Octavio Jiménez Monterroza stirs the agave mash, which will be fermented in wooden barrels for three to ten days before the juice is then separated out and distilled. 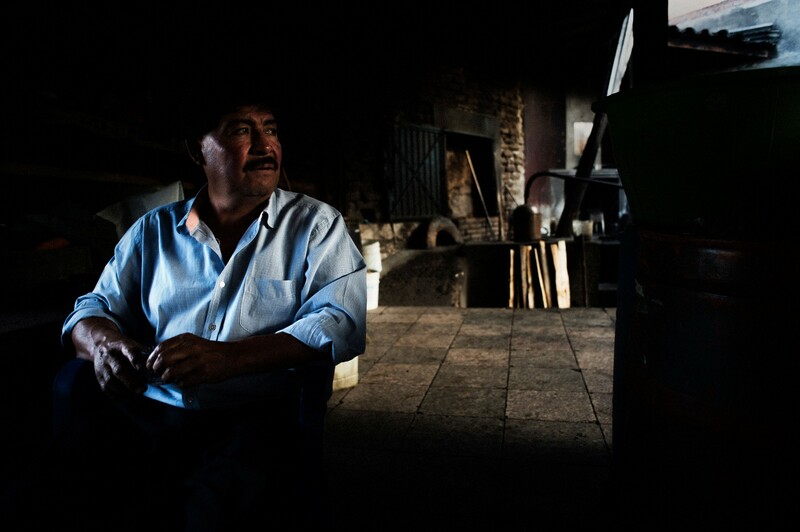 The art of producing mezcal was passed down to Octavio from his father, Don Isaac, whose name adorns the family label. 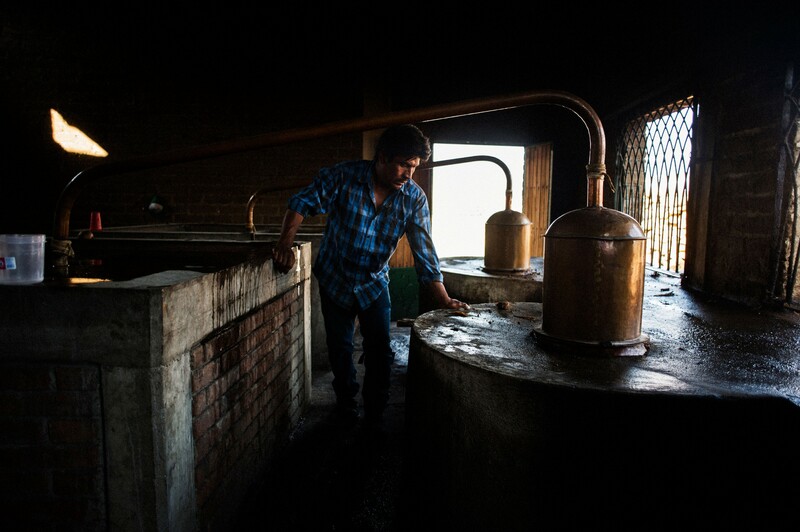 Preparing the copper stills at Fidencio mezcal. While your average tequila factory looks like the inside of a spaceship — pristine, full of gleaming metal ducts and tanks, plus an array of gauges and knobs — the most technologically advanced thing you’ll find in a mezcal distillery, or palenque, is a horse. The animal’s job is to walk in circles towing a half-ton concrete or stone wheel which looks like it belongs in an episode of The Flintstones. 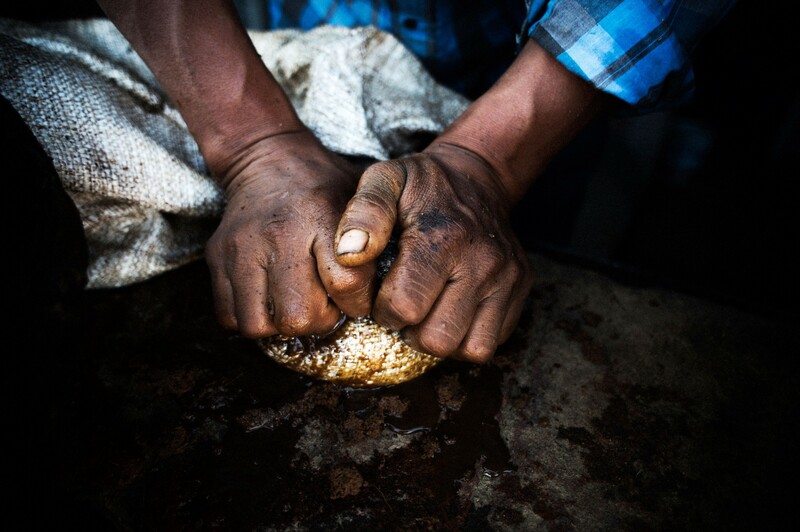 The wheel is used to crush the agave hearts which will be fermented and distilled to make the final product — the only part of the process that is no longer done by hand. 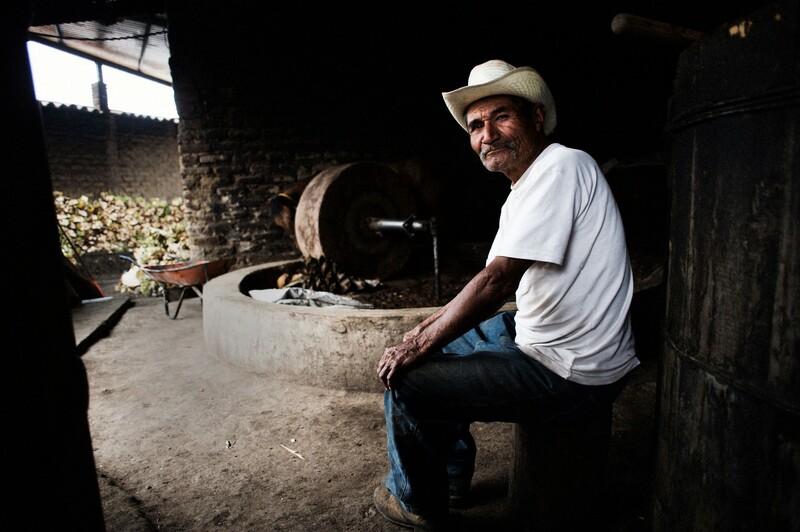 A mezcalero sits in front of the large stone wheel used to break down agave into a pulp. 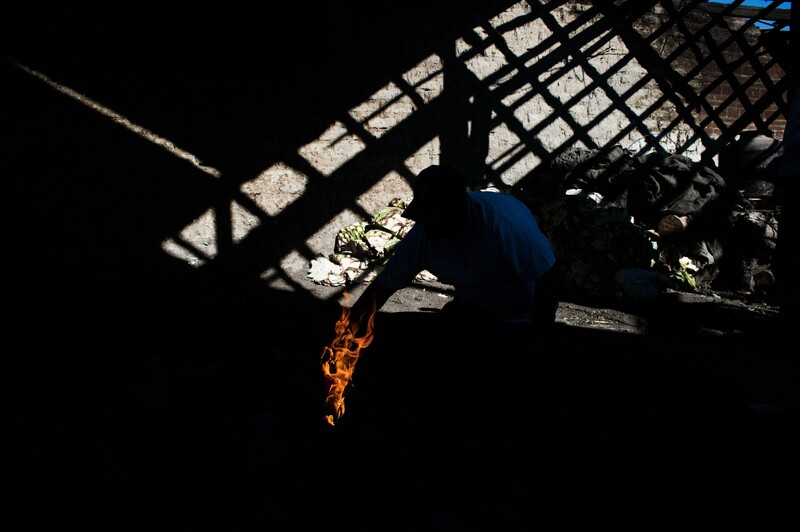 A worker lights the fire to begin the roasting process of the agave “piñas” underground. 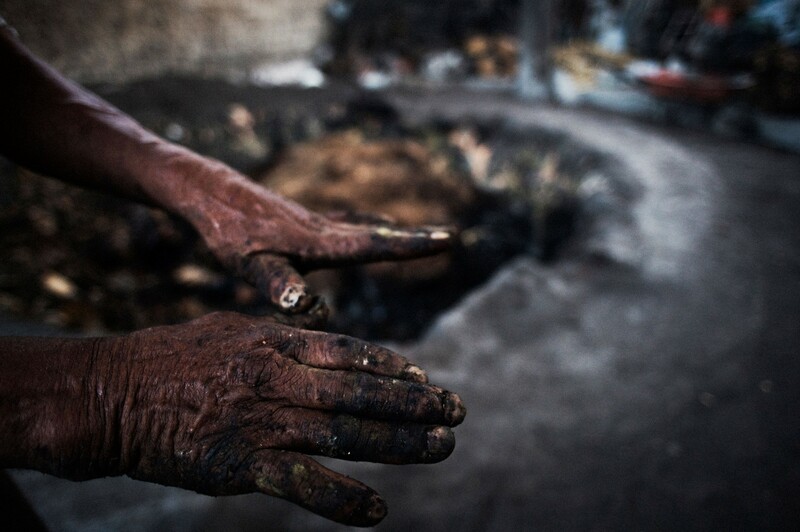 A mezcalero’s hands after clearing the earth oven of cooked agave. 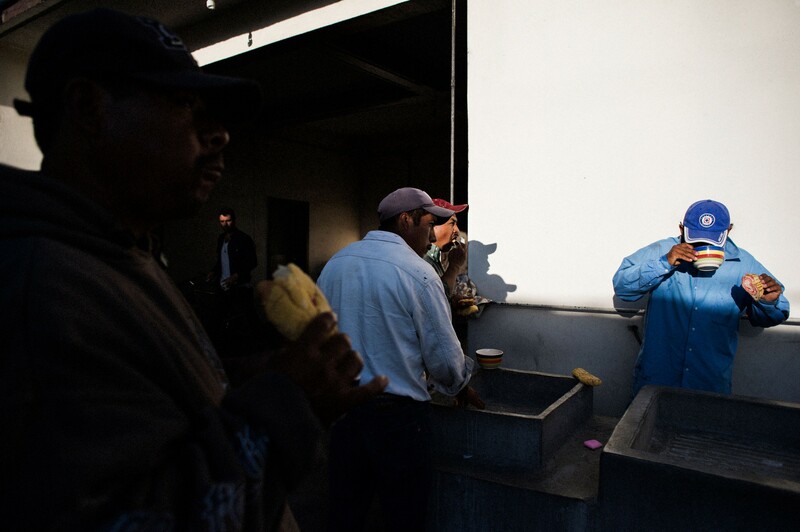 Workers fill up on pan dulce and hot cocoa before heading into the field to harvest agave. 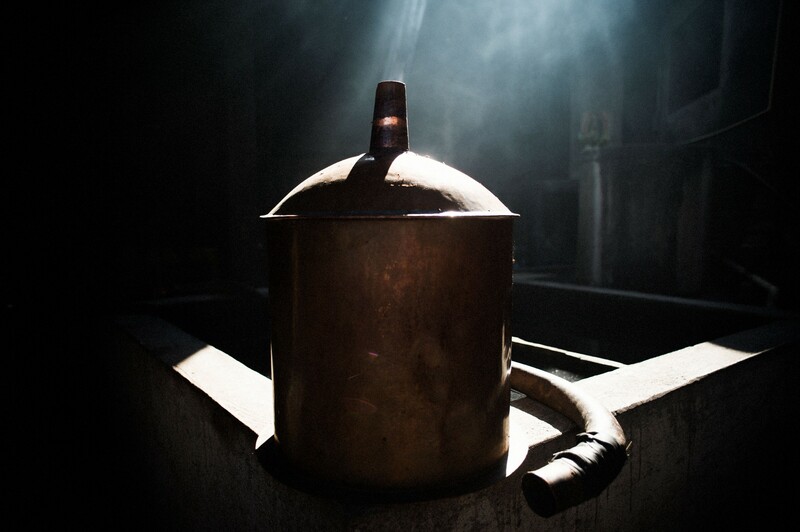 Copper stills were introduced by the Spanish, replacing the clay stills with which the spirit had traditionally been produced. Mezcal, like tequila, is made from the pineapple-shaped cores of cooked agave plants, but the two drinks are very different. Modern tequila, whose primary ingredient must by law be blue agave, is essentially an industrial product, with a clean, somewhat neutral flavor that reflects a mechanized process during which the agave is typically steam cooked. Mezcal, on the other hand, is made in a rustic, artisanal manner which has changed little since the early days of the Spanish conquest. 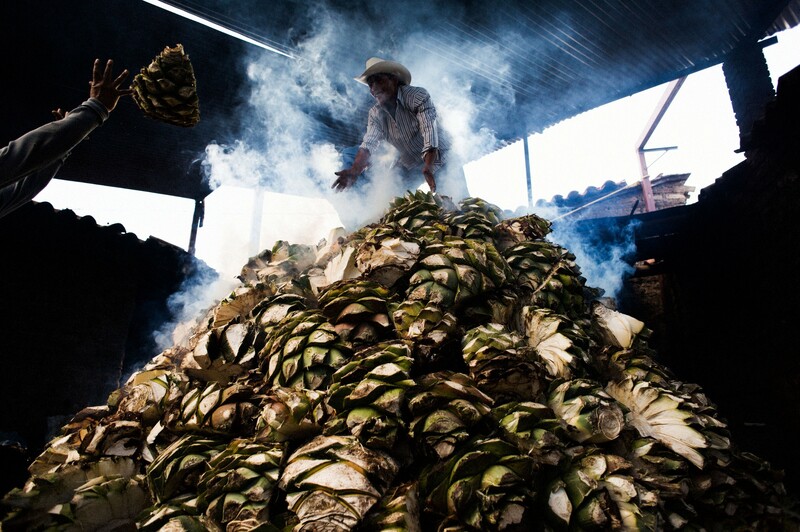 To roast the agave hearts, which can be from any of 40-plus species of the plant, they are buried in a huge earthen pit with rocks and burning wood for several days, before being crushed and fermented using wild airborne yeast (the flies on the open fermentation barrels help eat the sugars). Master Mezcalero Octavio Jiménez Monterroza siphons some mezcal from the barrel as a treat for some of his workers after a long day. 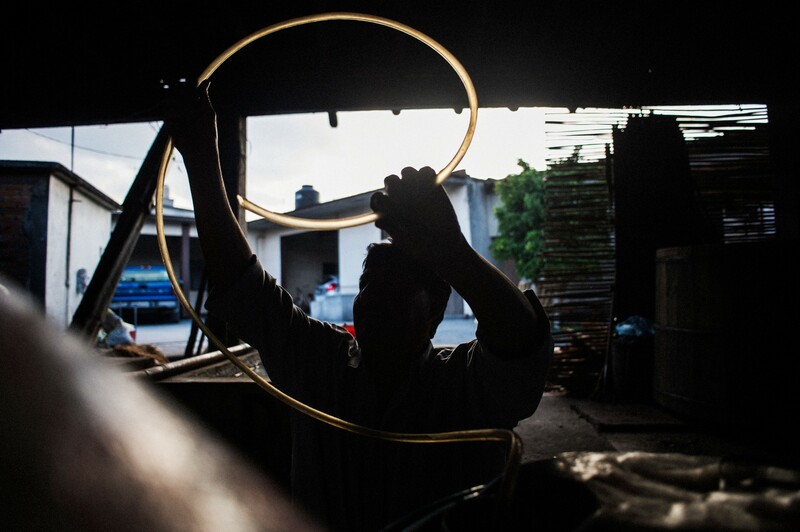 A worker prepares a glue used to bind copper pipe to the still in which mezcal is distilled. María Elsa Méndez Juárez, the wife of Octavio Jiménez Monterroza, hosts tastings of the family’s many types of mezcal produced under the label Don Isaac. The bamboo shoot she holds is used to extract the finished product from the barrel. The result is a distinctly smoky, sometimes funky-tasting drink. The numerous variables in its production (not least of which is the hand of the individual maker), lead to a huge variety of flavors. Mezcals can be darkly fruity, grassy, spicy, chemical-tasting (particularly if the first part of the distilled liquid is used), or just straight-up boozy, since this is a spirit which can be 160-proof. If you put this variety in your mouth while visiting a rural palenque and standing in the hot sun, it seems as though the alcohol is evaporating through your nose before you can swallow it. 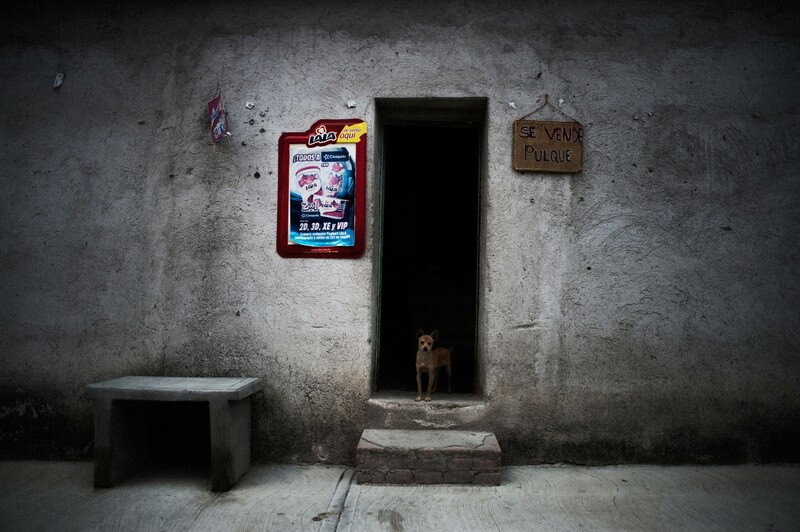 While most mezcal is exported to bigger cities or, increasingly, other countries, the working class in the towns which produce the spirit are more likely to drink pulque, an agave drink which undergoes no distillation process. Instead, different fruits are mixed with the fermented agave juice to create a beverage with an alcohol content comparable to that of beer. 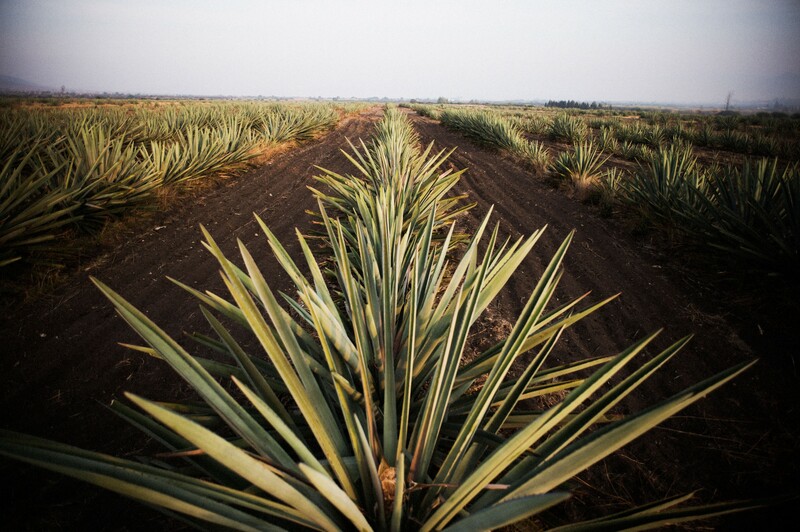 Espadin agave, some as tall as ten feet high, sit in neat rows on the land belonging to Fidencio Mezcal, a label that has become popular in the United States. Octavio Jiménez Monterroza enjoys a glass of mezcal with friends. The future of the industry is in question, as demand is quickly outstripping supply and those trying to preserve the traditional, artisinal means of production are having to compete with larger producers. But relatively little mezcal is actually consumed where it’s created. The people who make it tend to drink beer after work, and the results of their labor are traditionally used during multi-day weddings which begin with the judge being given a shot of the good stuff, or at quinceañeras — Mexican “sweet 15” celebrations which, despite marking the birthday of a schoolgirl, are occasions for serious imbibing of strong liquor. 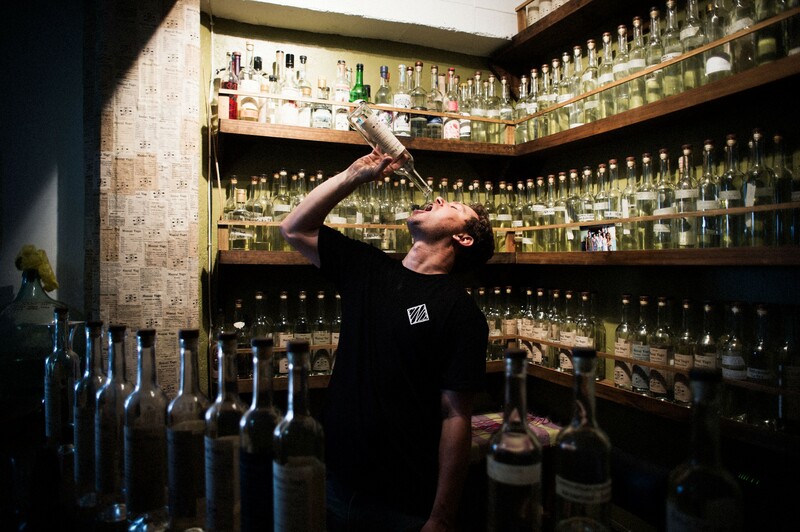 Judah Kuper savors the very last drops of a rare arroqueño mezcal at his Mezcal Vago tasting room in Oaxaca. Kuper is at the forefront of a movement to return mezcal to its roots, through experimenting with original clay pot distillation and aging. 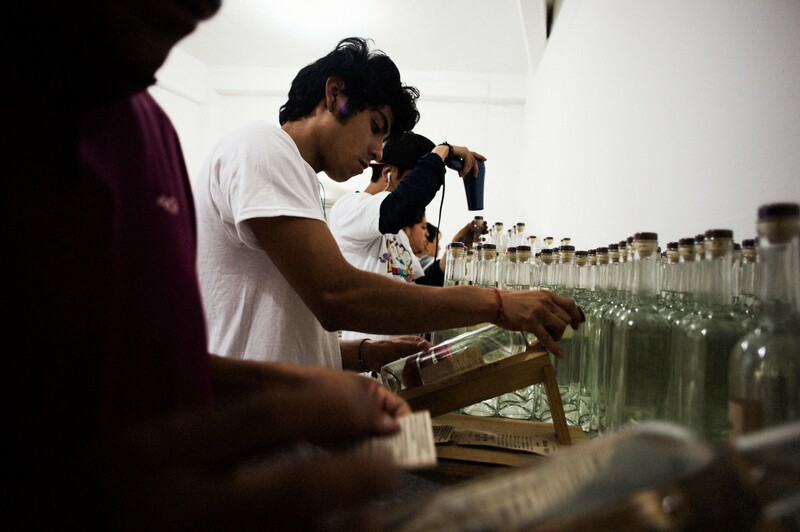 Workers bottle Mezcal Vago for sale at the label’s headquarters in Oaxaca. 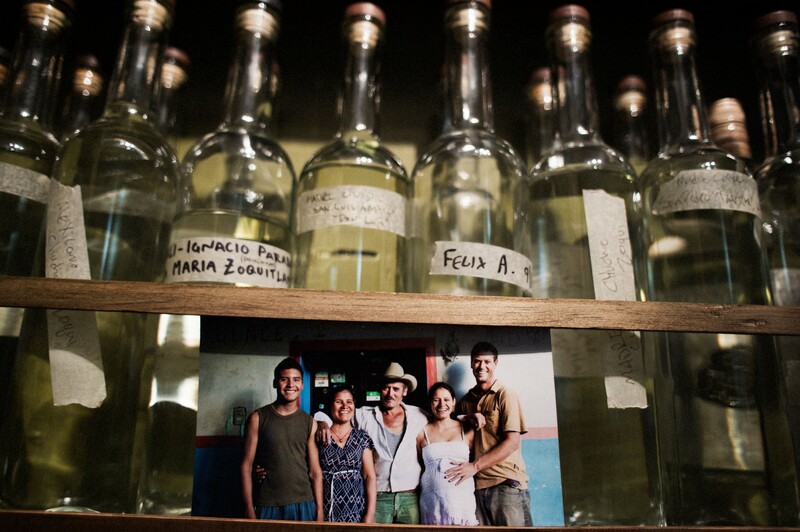 A picture of the Mezcal Vago family sits behind the bar at the Mezcal Vago tasting room. 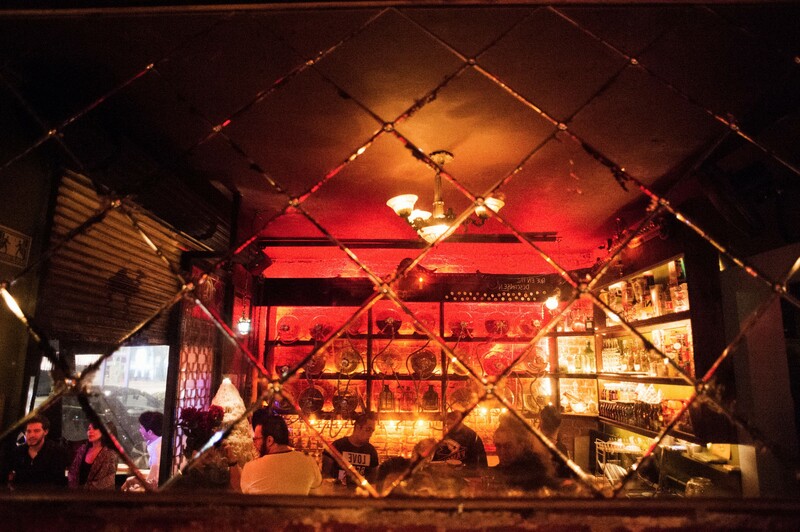 Mezcal is mostly drunk in cities, in bars like Loló in San Francisco or Mexico City’s Clandestina, one of the capital’s best-stocked mezcalerías. 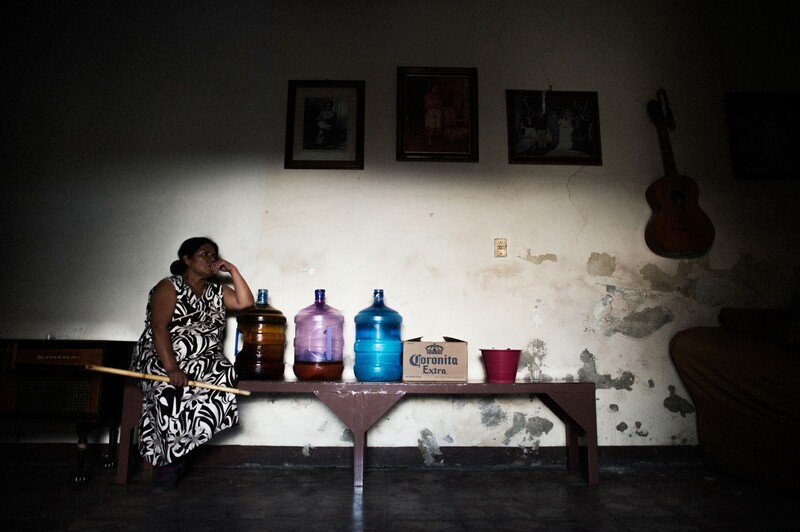 Clandestina’s owner, Karla Moles, has two brands of her own (Enmascarado and Milagrito Del Corazón) and she regularly visits Oaxaca in search of new varietals, which are arranged on the back wall of her small bar in traditional glass jars connected to hoses for serving. The place looks as though it belongs to a mad scientist who likes a drink or two. 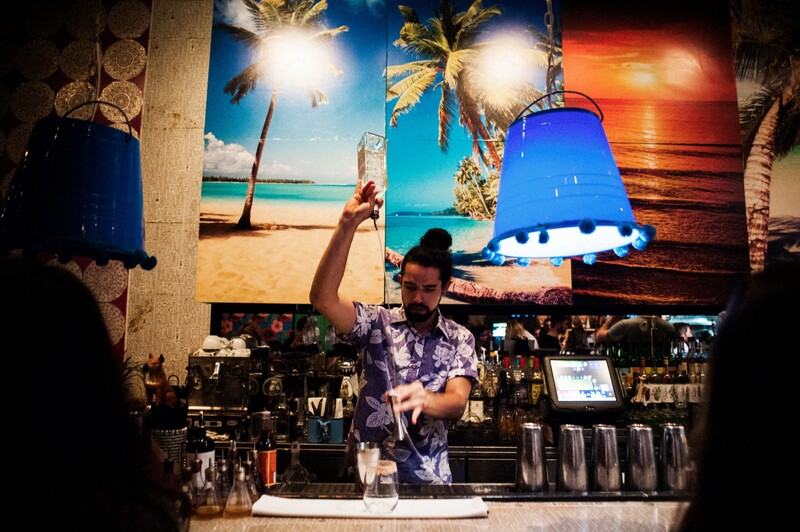 Bartender David Gallardo is a mixologist at Loló, a restaurant in San Francisco’s Mission District with an extensive selection of high-end mezcal and tequila. Gallardo, a mezcal expert, moved from Guadalajara to help Loló with their selection. 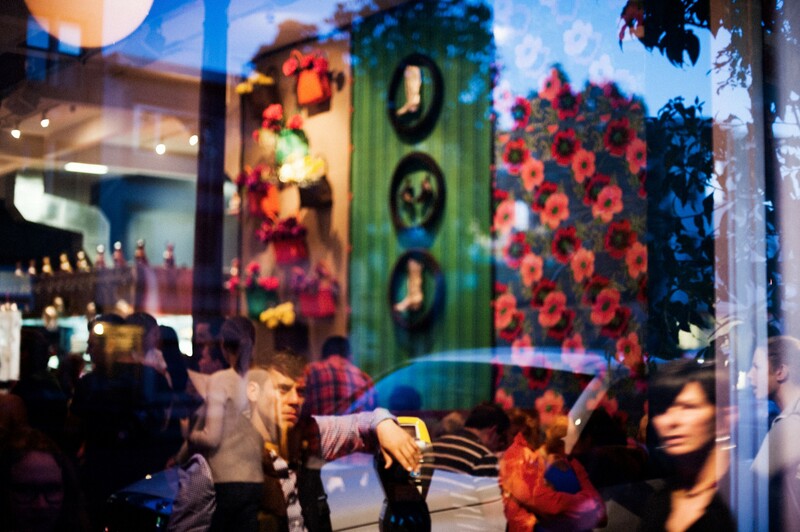 Patrons wait outside of Loló. Customers at Legion Americana Bar in Mexico City try a flight of wild agave mezcals. Clandestina’s customers are mostly middle class urbanites, but the drink is made by campesinos whose families have been living and working in the countryside for generations, in areas where levels of formal education are not high. 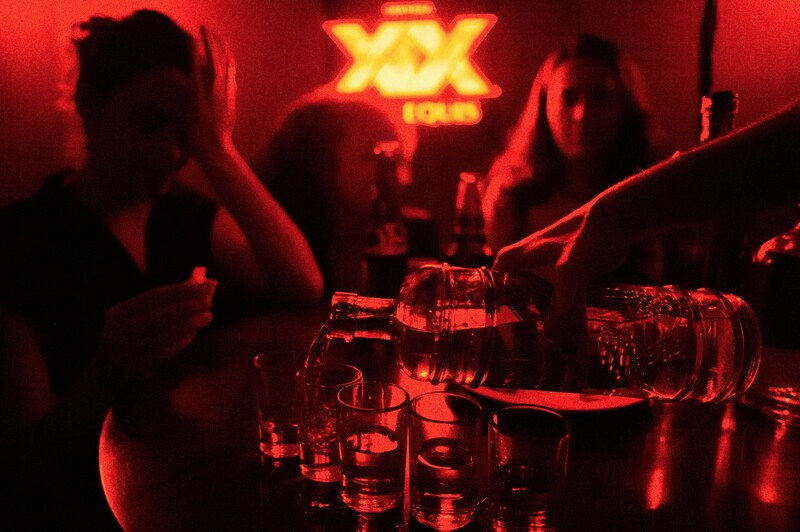 Until the recent boom in the drink’s popularity, many mezcaleros had little contact with Mexico’s cities — never mind the foreign countries where their product is now sold. Patrons at Bar Clandestina in Mexico City on a Saturday night. The best-known of the country’s mezcal-producing areas is the state of Oaxaca, where the family of Pepe Jiménez makes some extremely well-regarded hooch (theirs is the house brand of several restaurants in Ciudad Oaxaca, one of Mexico’s gastronomic hubs). 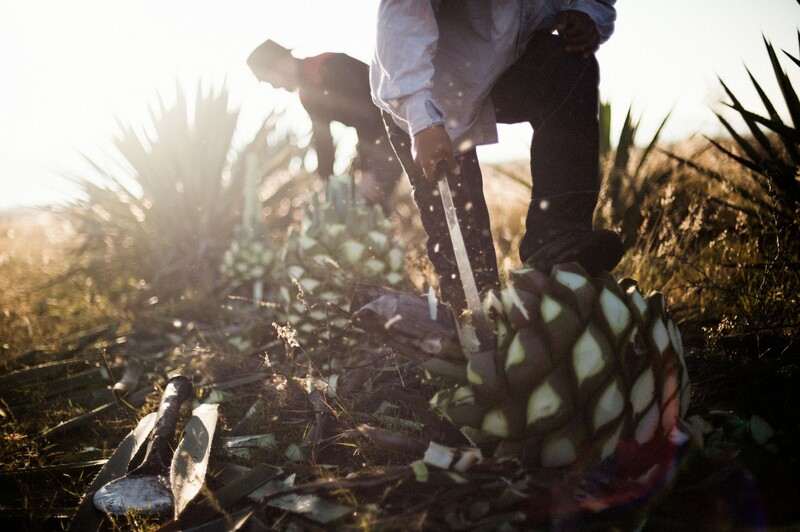 Their line is named Don Isaac, after Pepe’s late grandfather — the family has been making mezcal for five generations, which is not uncommon in this community. 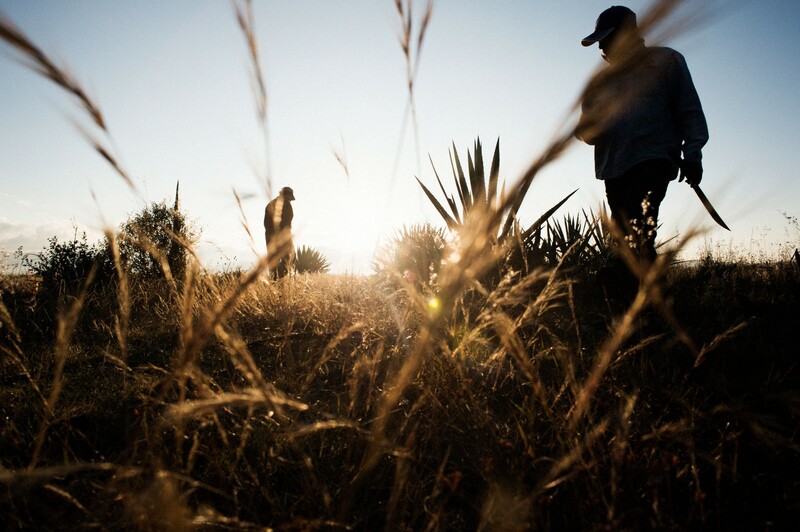 The Jiménez family create some of their product from farmed espadín, which can reach maturity in around seven years, but they also use wild agaves, such as tepextate. This plant needs to grow for around 25 years before it’s ready to be used, and the heart, or piña, from one of them can weigh over 400 pounds. 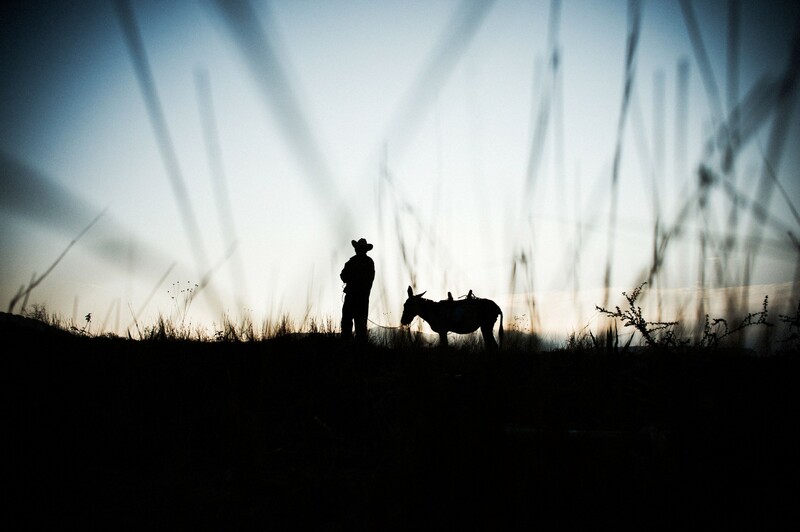 “To get those wild agaves,” says Jiménez, “people have to go deep into the mountains to find them.” When a suitable plant is discovered and cut from the earth using machetes, it will be taken back to the palenque using donkeys, which can navigate the hilly terrain better than any vehicle. Jiménez adds that it takes around 40 pounds of tepextate to produce a single bottle, making it perhaps the most labor-intensive liquor in the world. 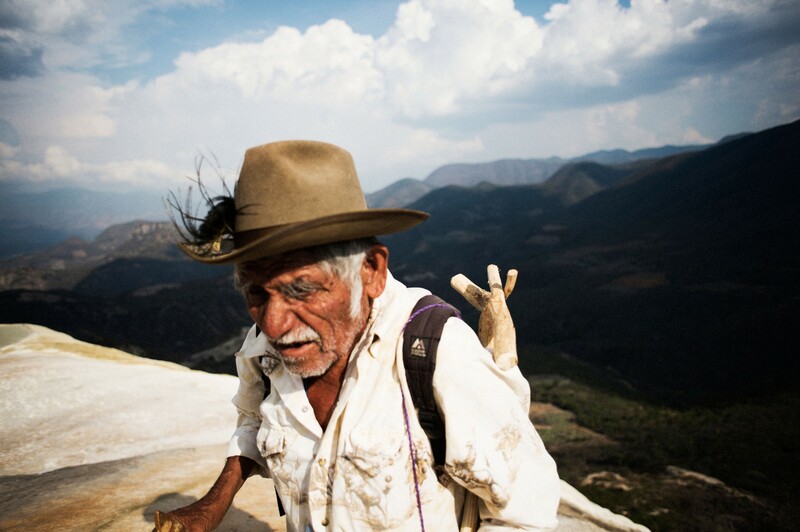 A guide in the Oaxaca hills hikes through the mountains while attempting to locate wild agave. 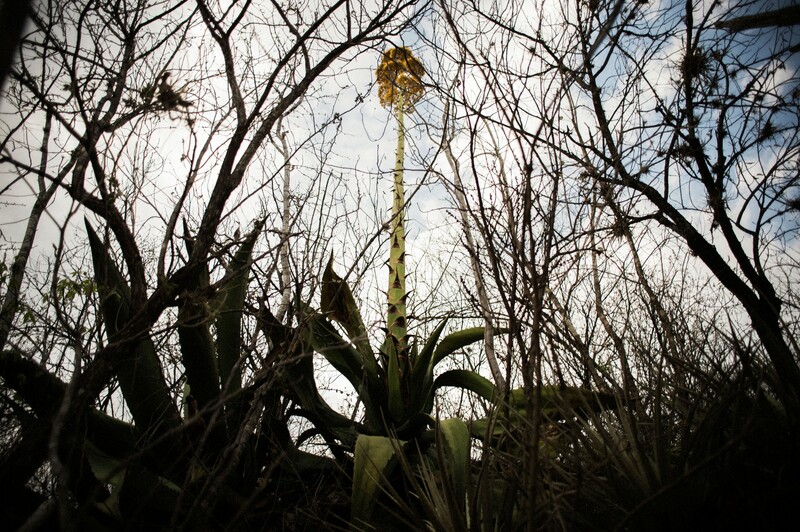 A very rare tepextate agave in the Oaxacan hills. This one is in full bloom, shooting its “quiote,” or flower, 25 feet into the air. The agave flowers only once in its 20–30 year lifespan, allowing only a very brief window for harvest before it dies. Donkeys are often used to transport wild agave from the hills where they are harvested to the palenques. 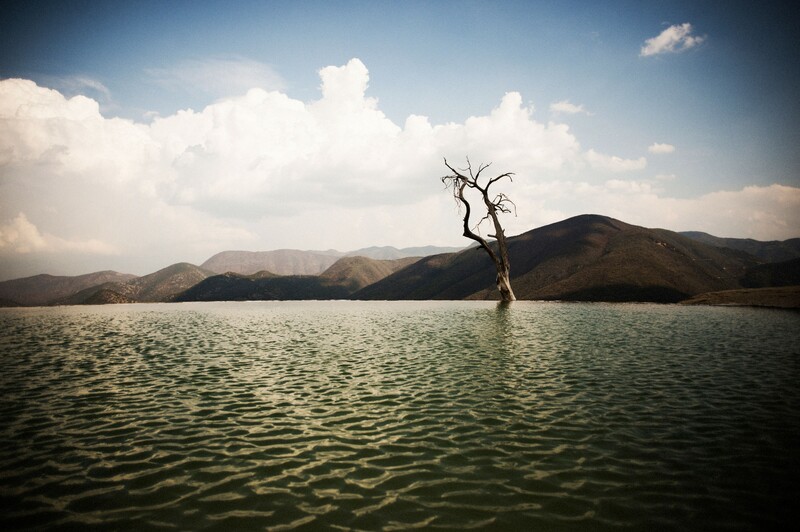 The waters of the Hierve el Agua waterfall in Oaxaca, Mexico are surrounded by hills teeming with wild agave plants. Which is all the more reason to treat it with the respect it deserves. In the United States, the rise of mezcal has mostly been through its use in cocktails, which is, frankly, a shame. No sane person would combine a 16-year-old Islay Scotch or Kentucky bourbon with fruit juice or other adulterants, and there’s no reason to treat this spirit any differently — especially if you want to savor its nuances. In order to really experience a good mezcal, it’s best to drink it like the Oaxacans do — not necessarily while officiating at a wedding or hanging out at a kid’s birthday party but, at the very least, neat.